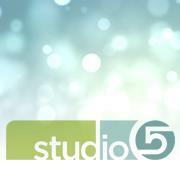 I love decorating for Christmas but I don’t have unlimited funds to be able to purchase new decorations every year. Even if I did I don’t know if I would want too. Can you imagine storing all those decorations? 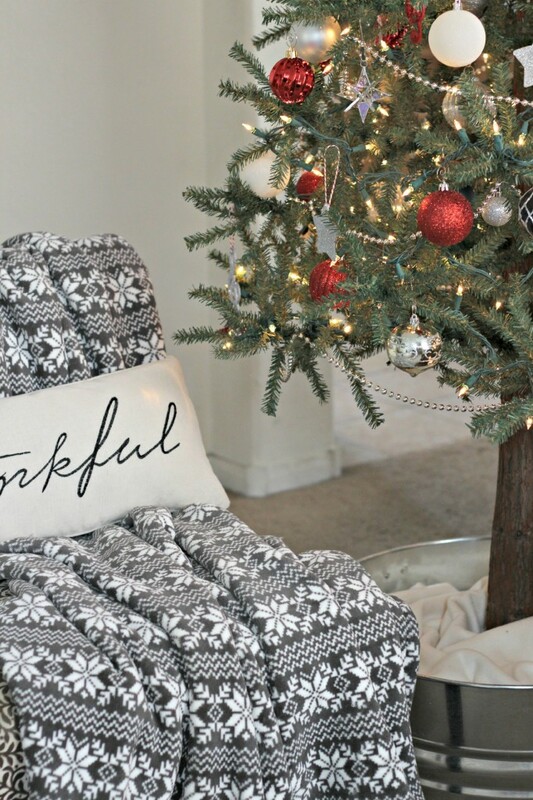 I rotate decor around my home throughout the year, so it makes sense that I would use a lot of the things I already have to decorate for Christmas also. 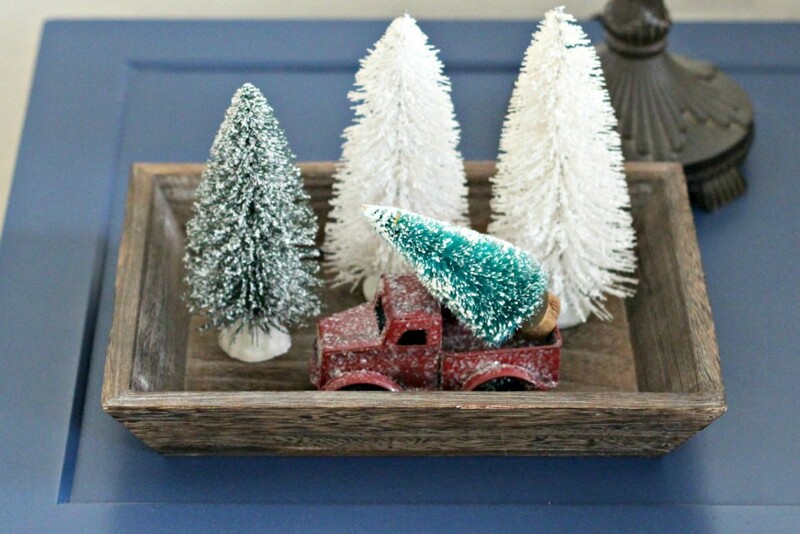 Here are some Thrifty Christmas Decorating ideas using things you probably already have. 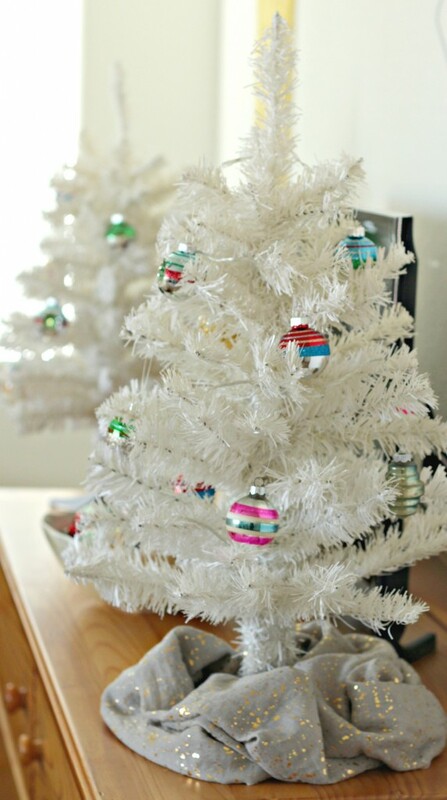 They’re a great place to start to highlight your Christmas decorations. *Let’s start with nature. 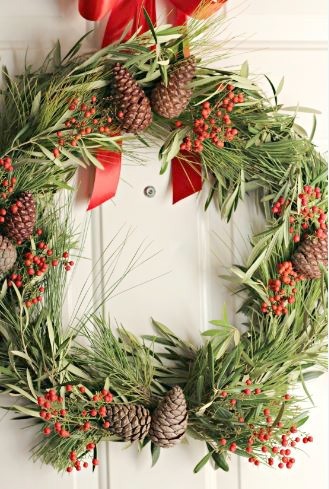 I am lucky to be able to walk outside my door to find berries, olive branches, pine needles, pine cones and other beautiful greenery. 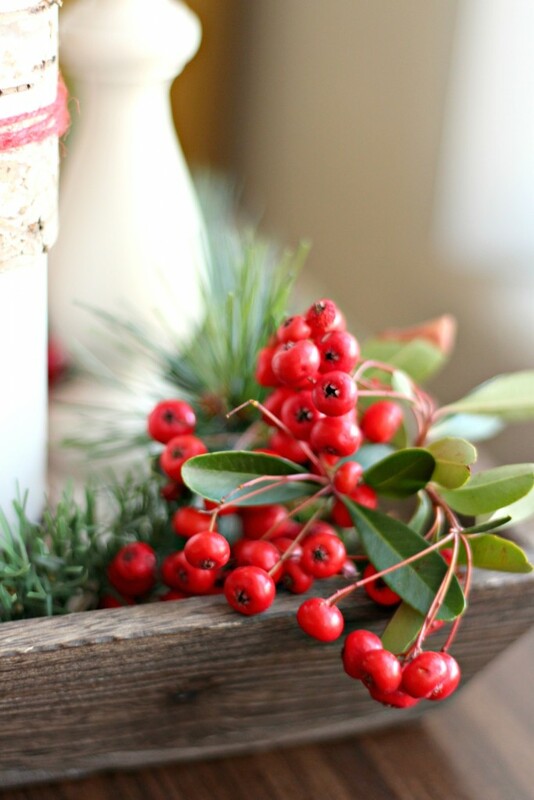 You might not be that fortunate, but look around or go for a little walk to see what nature you can bring in to use in your Christmas decorating this year. 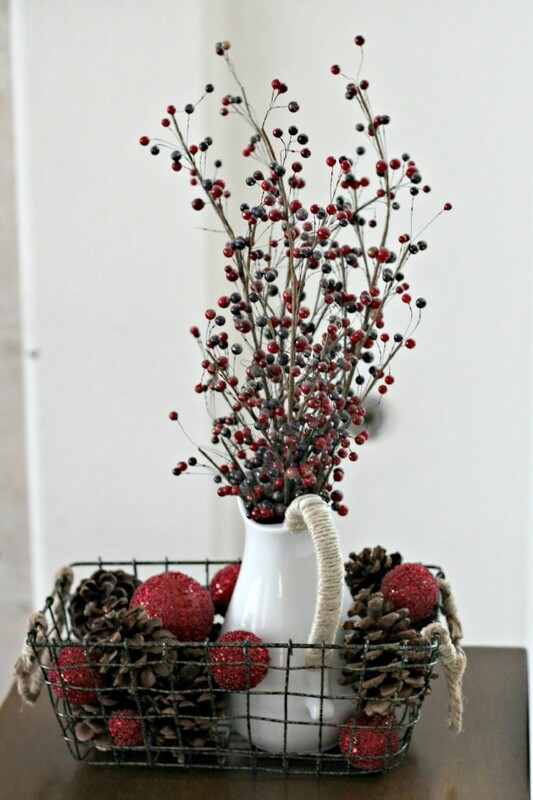 I love adding berries to already decorated spaces. 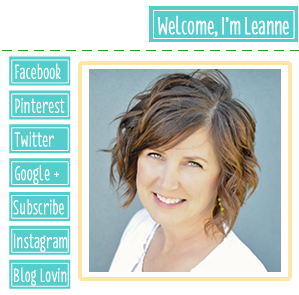 I just clip a few and add them to spaces that need more color. 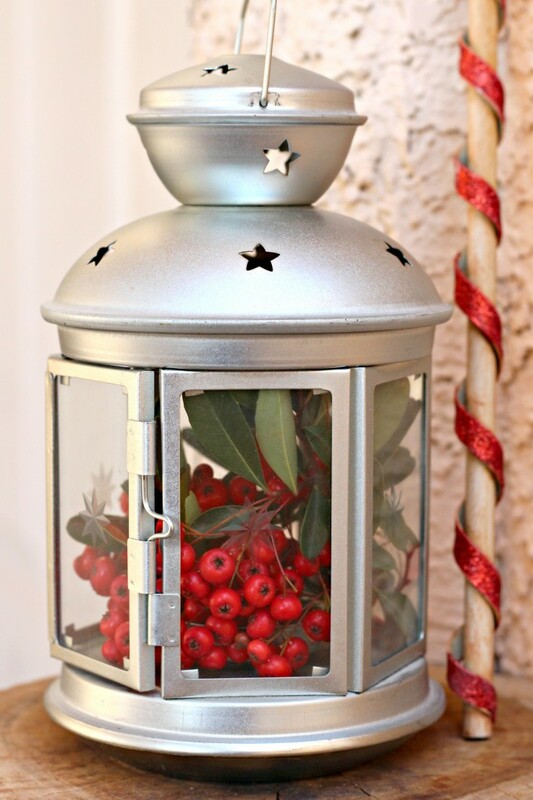 And it’s so easy, I literally threw the berries in the lantern and shut the door before they came falling out. 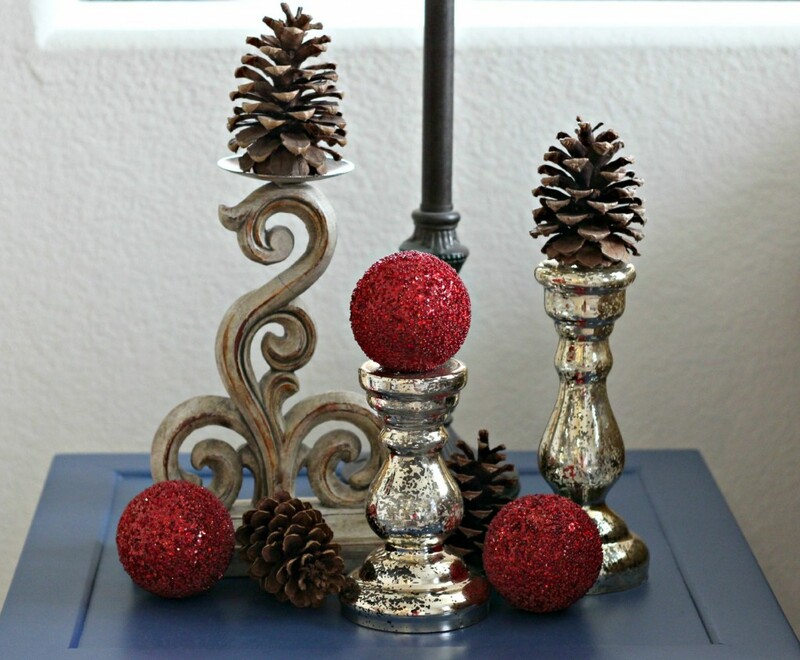 I love the texture pine cones add to my Christmas decor. 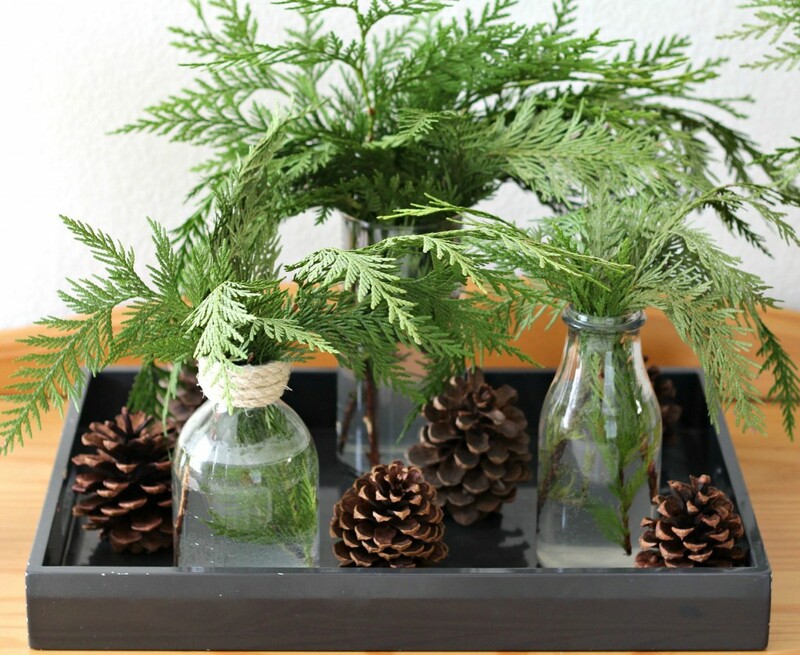 Make sure to cook the pine cones before you use them in decorating to make sure all the bugs living in them are dead. I don’t want you to have creepy crawlies in your house! 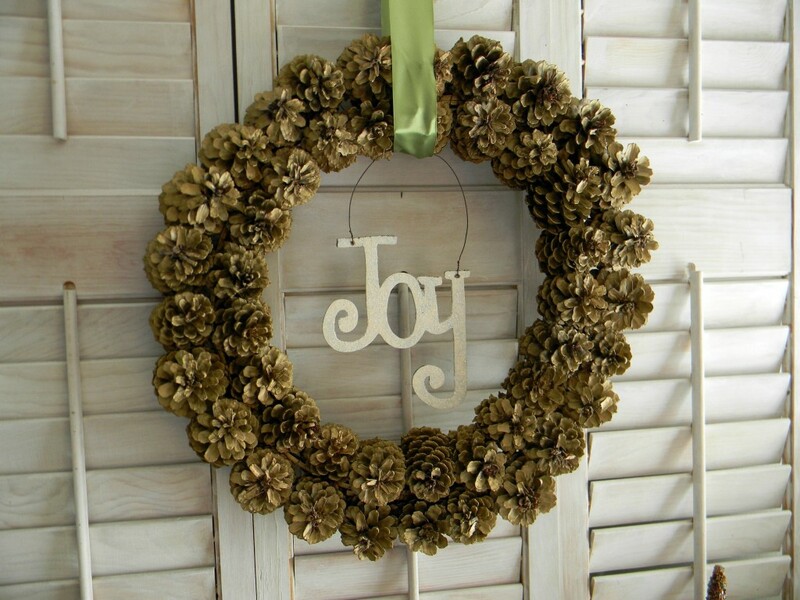 I spray painted the wreath gold after I attached the pine cones. 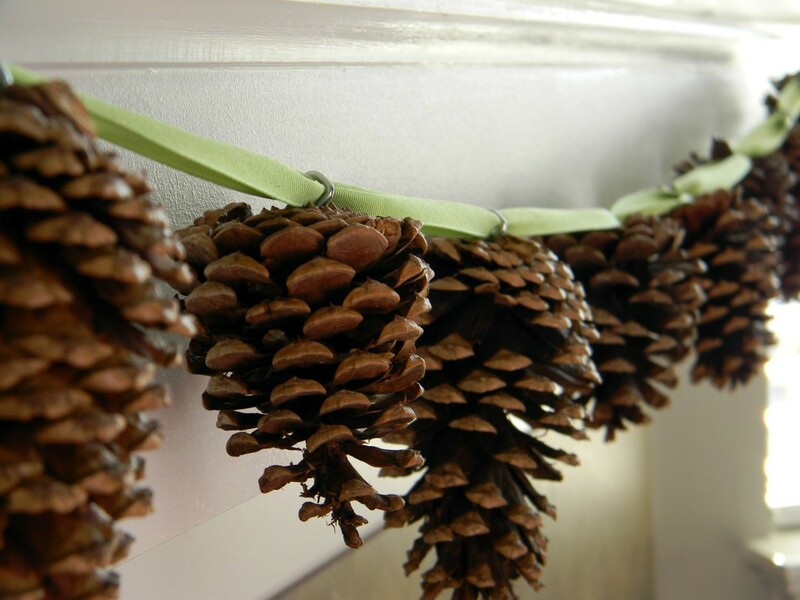 I screwed little eye screws into the bottom of the pine cones to make the pine cone garland. You will need to use some muscle and maybe some pliers depending on how tough your pine cones are. 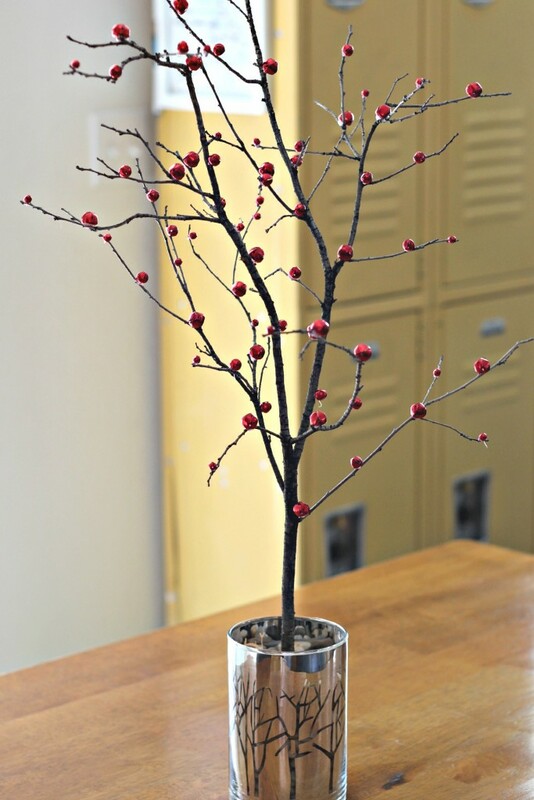 You probably need to trim the trees in your yard so you might as well bring the sticks in and decorate with them. 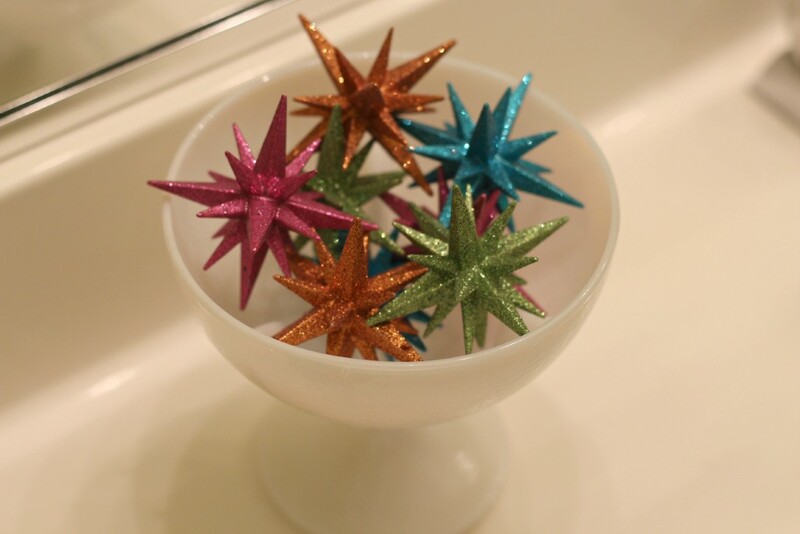 I made several twig star ornaments last year and also the jingle bell tree. 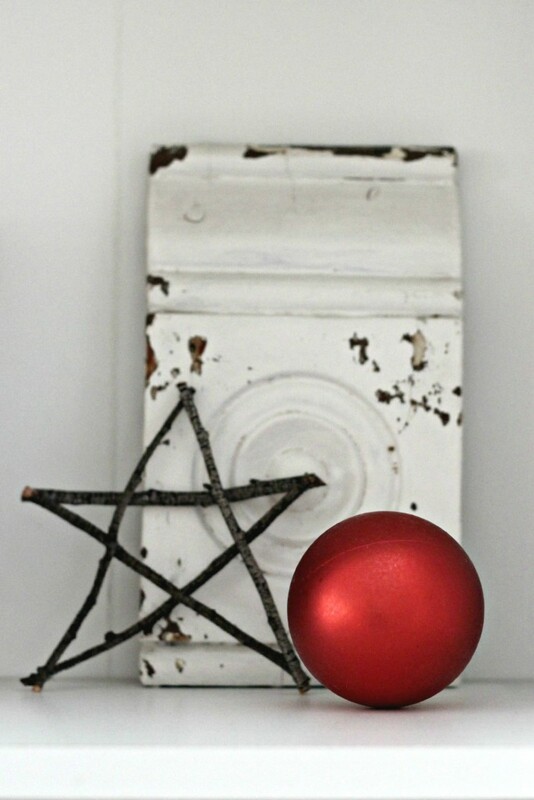 I’ve also made stick candle holders and filled clear ornaments with them for a natural Christmas decoration. I love bringing pine boughs in especially since we don’t have a live tree. We get the scent without needles falling everywhere. 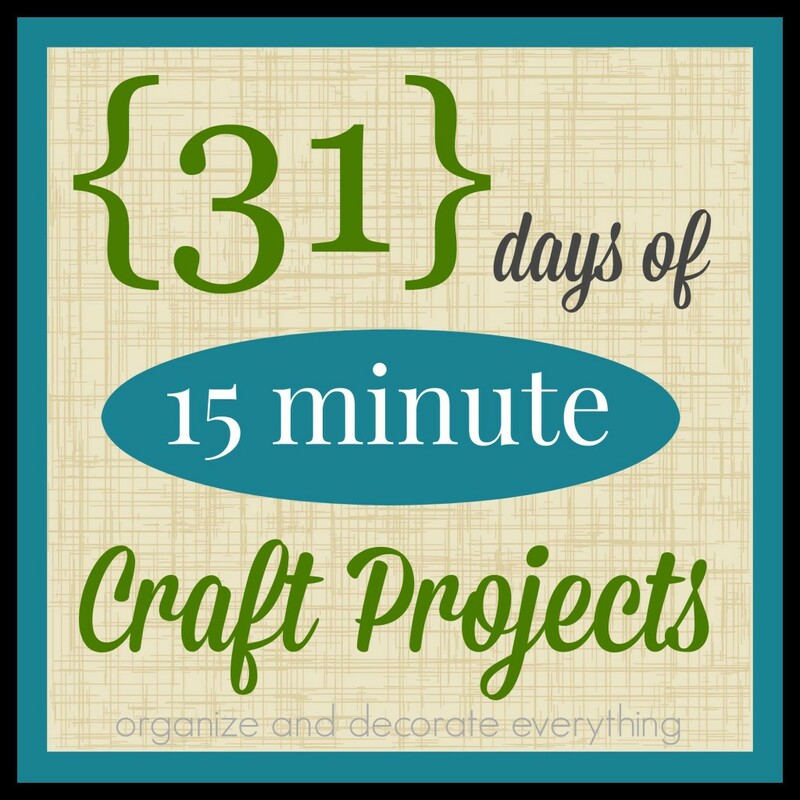 The natural wreath is one of my favorite projects. 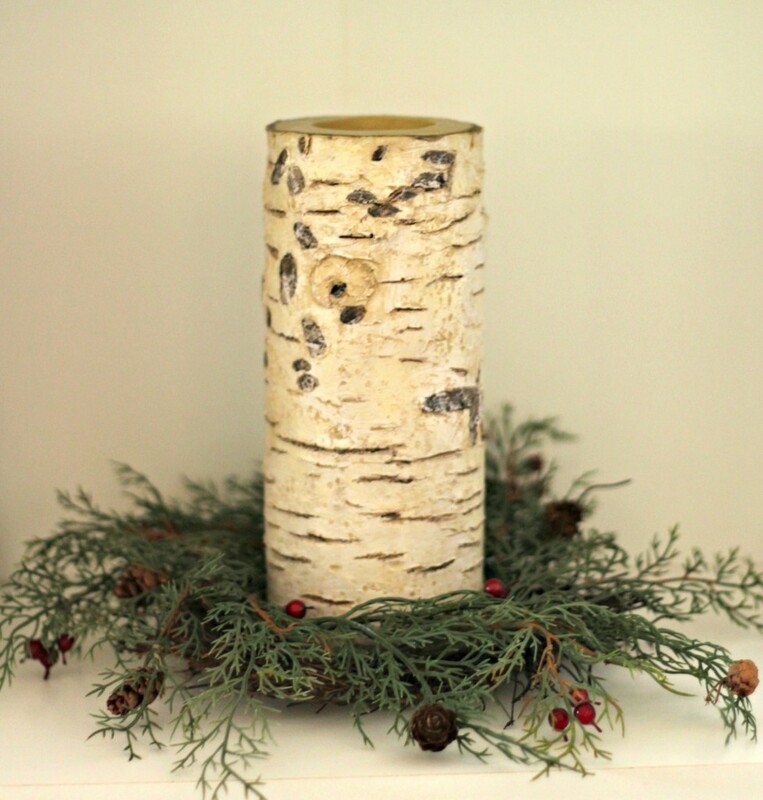 I used olive branches, pine boughs, pine cones, berries, and other greenery to create it. *Who has glass jars in their cabinets? 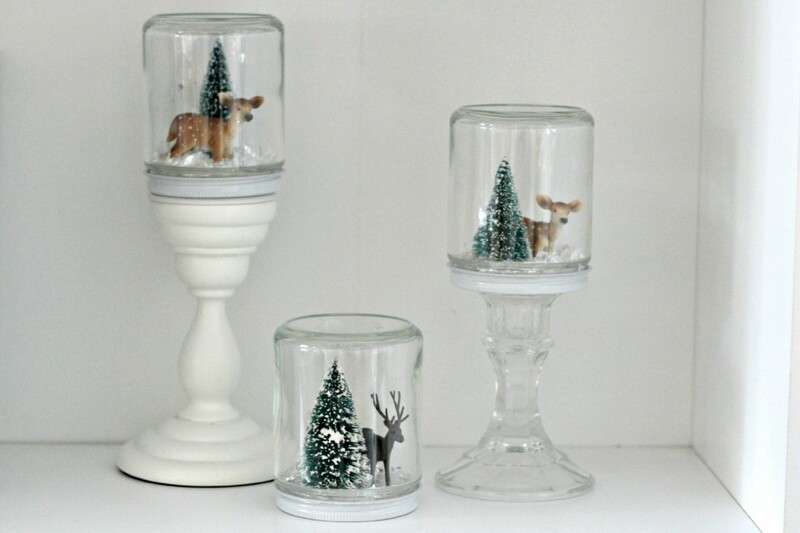 These waterless snow globes are such a pretty and easy project. Everything looks prettier under glass. 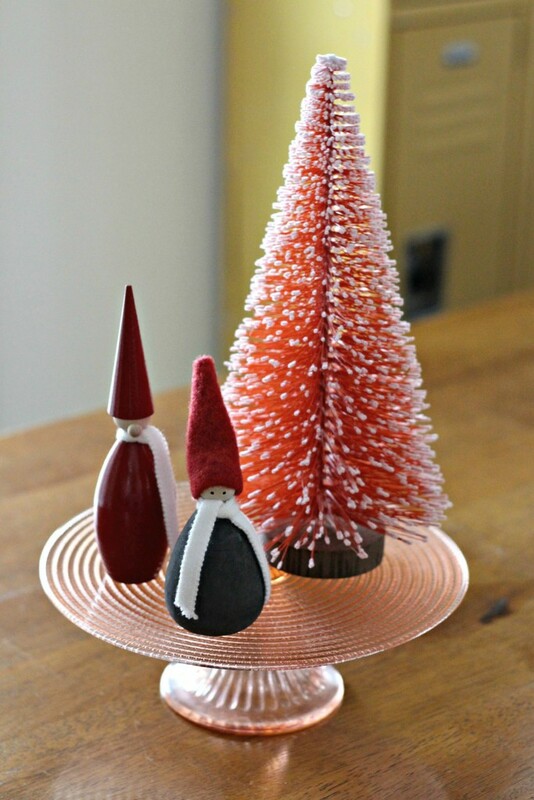 Add them to candle stands to vary the heights. 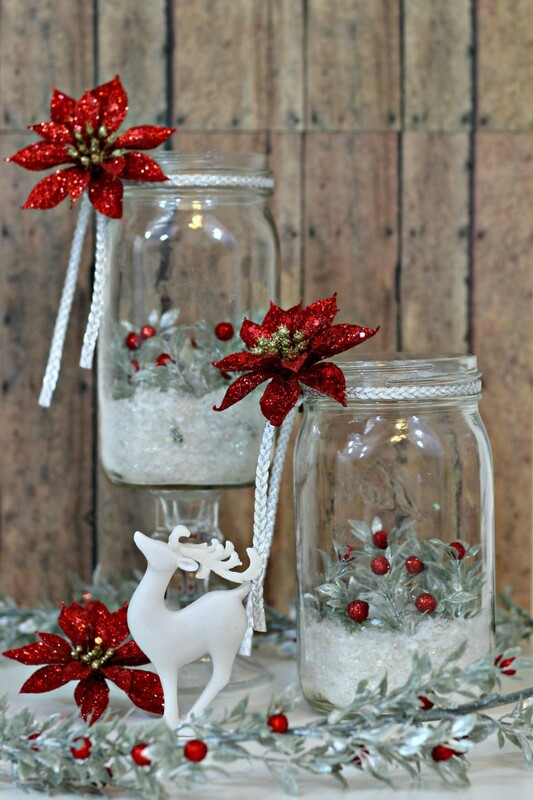 Add some greenery, floral picks, and battery operated candles to mason jars to make holiday luminaries. 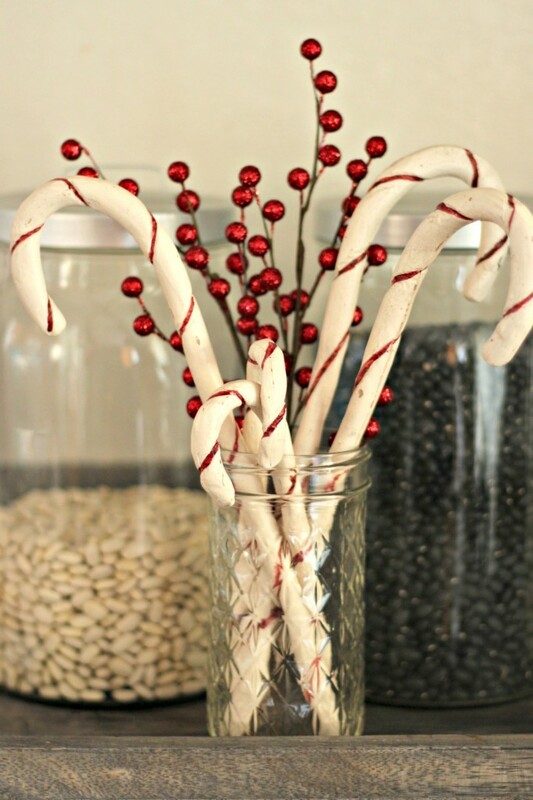 Or simply add candy canes or other Christmas decor to a textured jar for a pretty display. *Cake Plates can be used for more than just desserts. 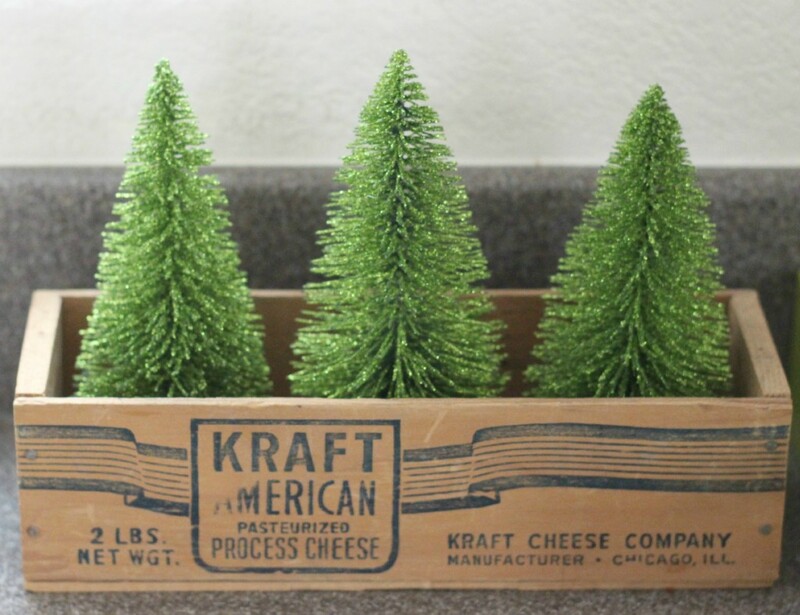 They are perfect this time of year for all your treats but they can also be used to add height to an item or to create a little Christmas scene. 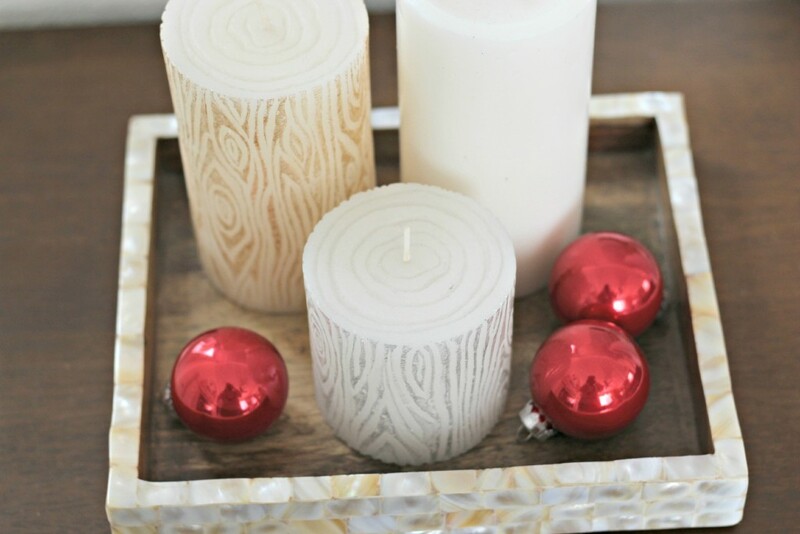 You can also glue a cute plate and a candle holder together to make your own. 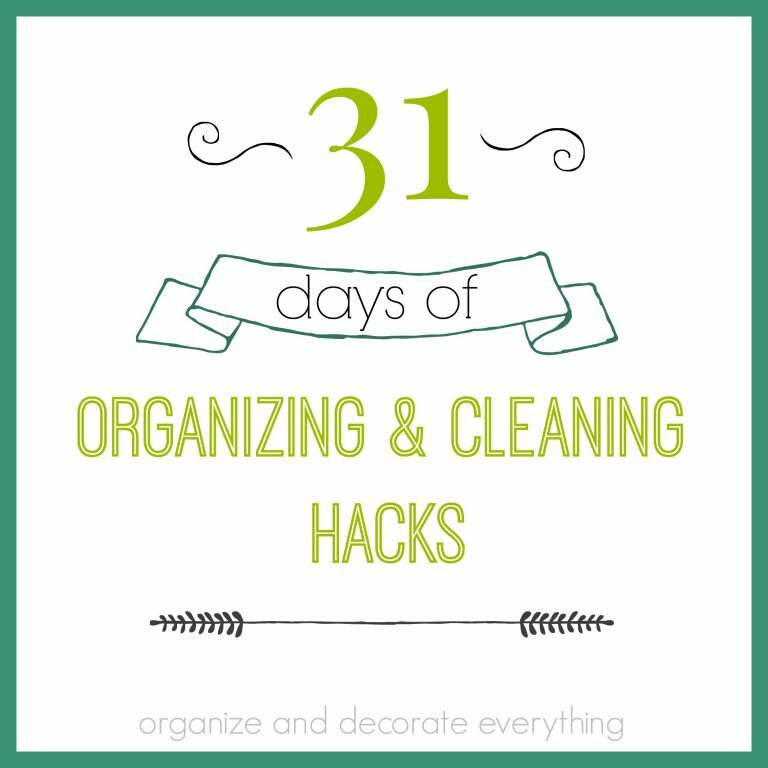 *Pull out bowls and other containers from your kitchen. 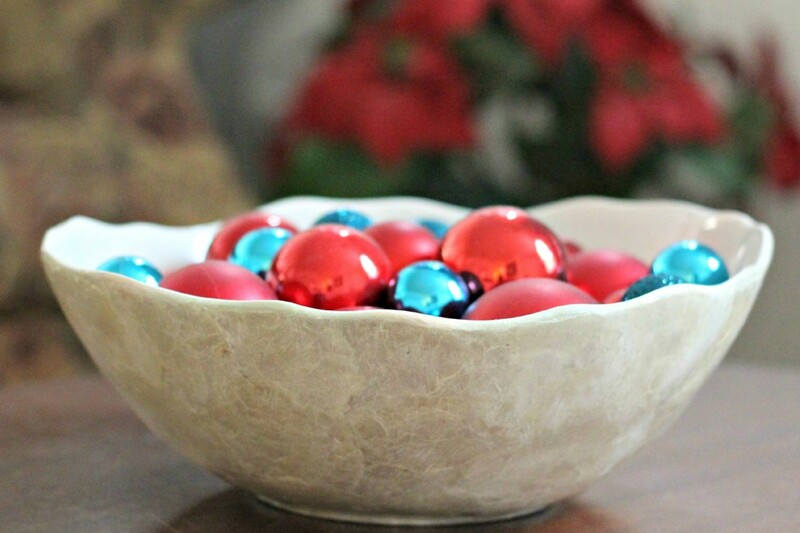 They are perfect for holding extra ball ornaments in your color scheme or theme ornaments for the year. 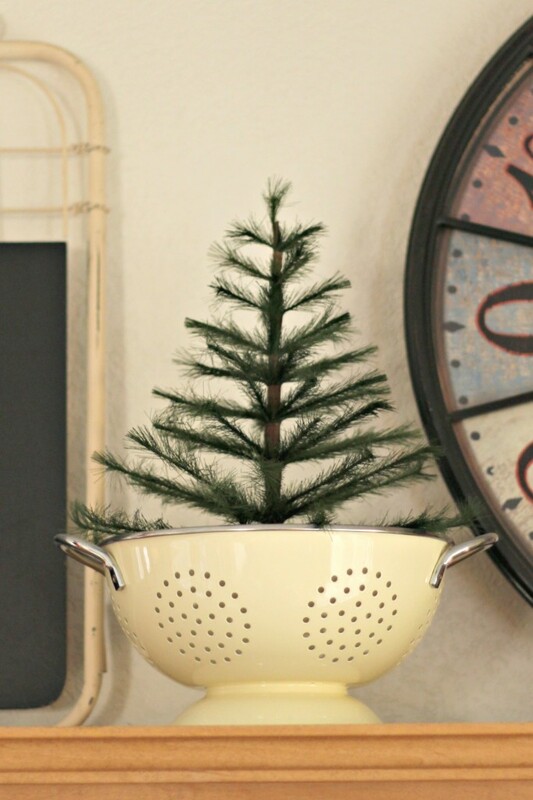 Add trees or other Christmas decorations to a colander, cheese box, or pitcher to make your space more festive. *Time to gather your candle holders. This first photo has basically everything in it, candle holder, glass jar, cake plate, bowl, and tray. I did really good at gathering for this vignette. 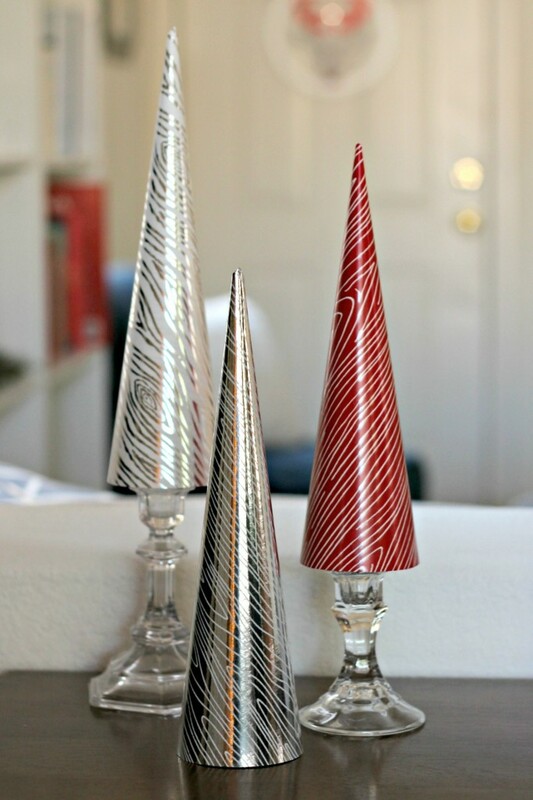 Most of us have several candle holders in several styles, so why not use them to add height and interest to your Christmas decor. 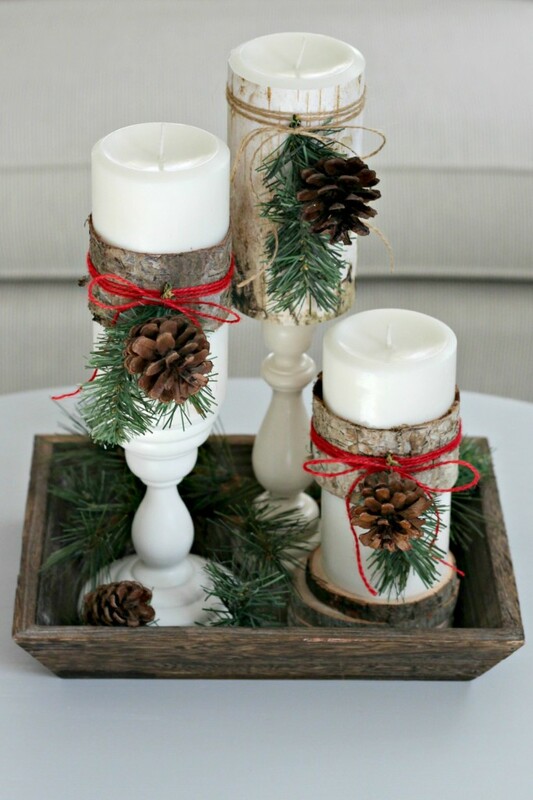 Add greenery around a rustic candle holder to make it festive for the holidays. 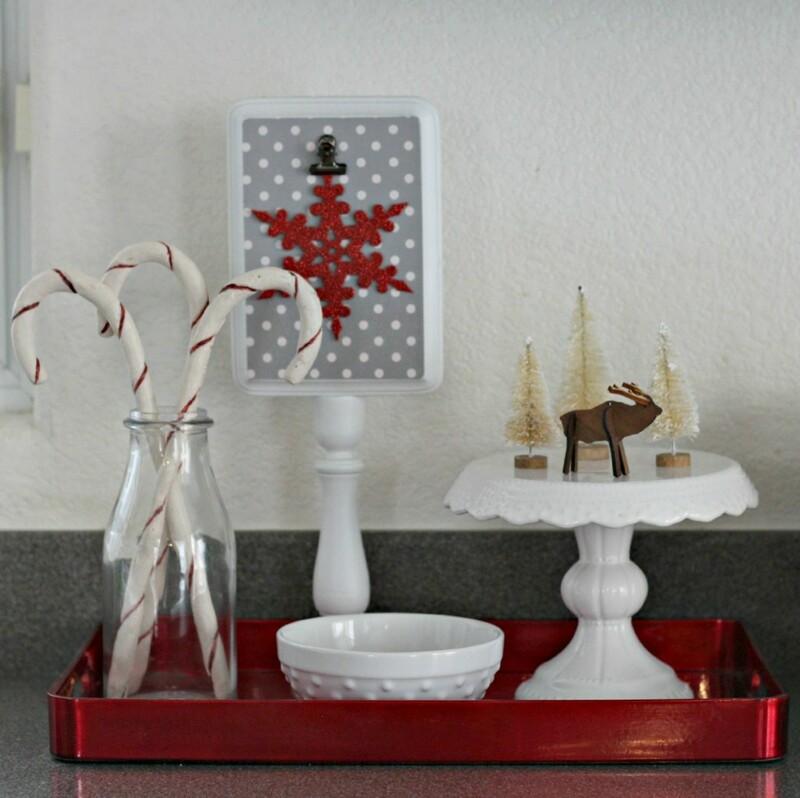 *Trays are a great way to pull different elements together. 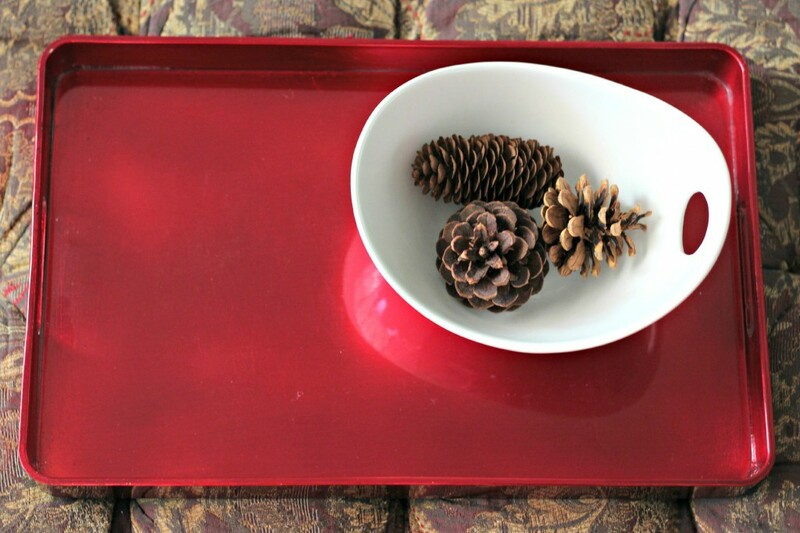 Luckily I have no shortage of trays since I use them often and in almost every room of my house. 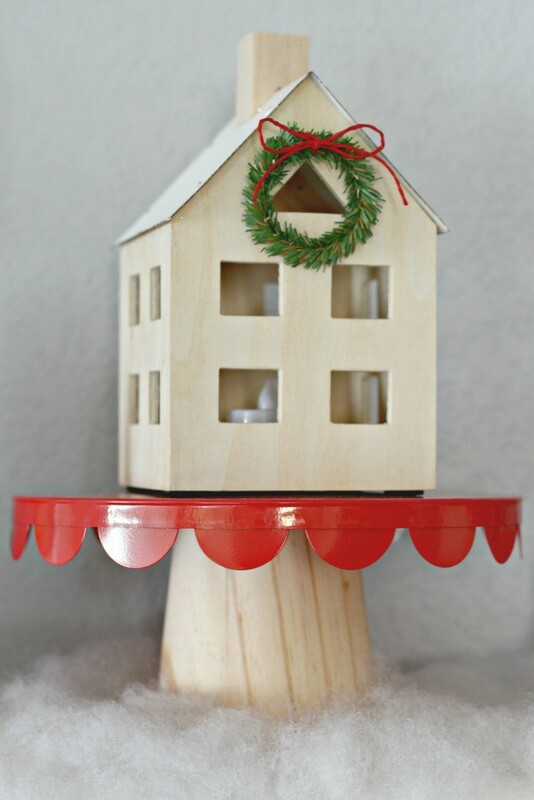 Add a few decorations to them or create a little scene and they’re perfect for Christmas. *Pull out your pretty fabrics. I don’t think I’ve used a tree skirt in over 30 years. 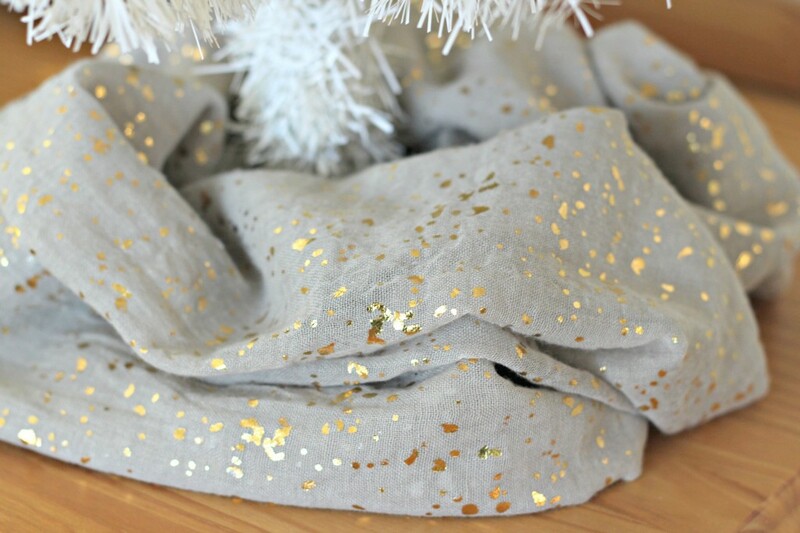 I used pretty scarves around the bottom of the small trees in my bedroom. 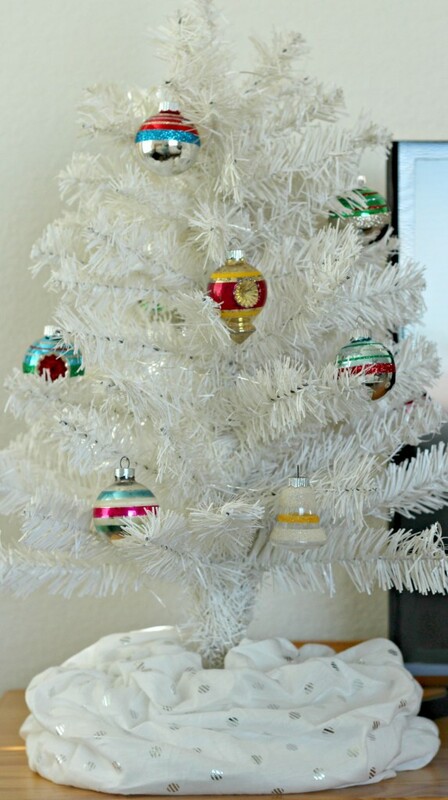 I usually put our large tree in a bucket and then use cream colored fleece to hide the bottom. I like how it looks like a snowy blanket. *Pull out the blankets. 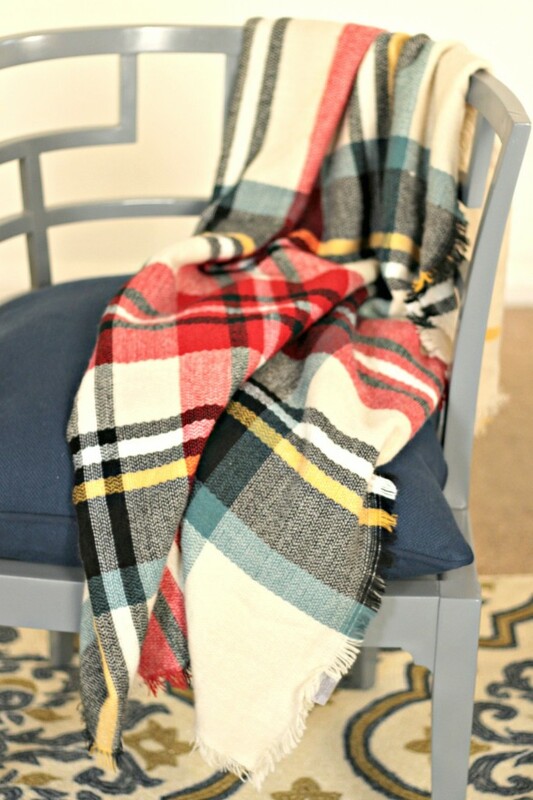 I usually keep blankets tucked away in a storage box or closet but I like to pull out the ones that coordinate with my color scheme for the Christmas season. 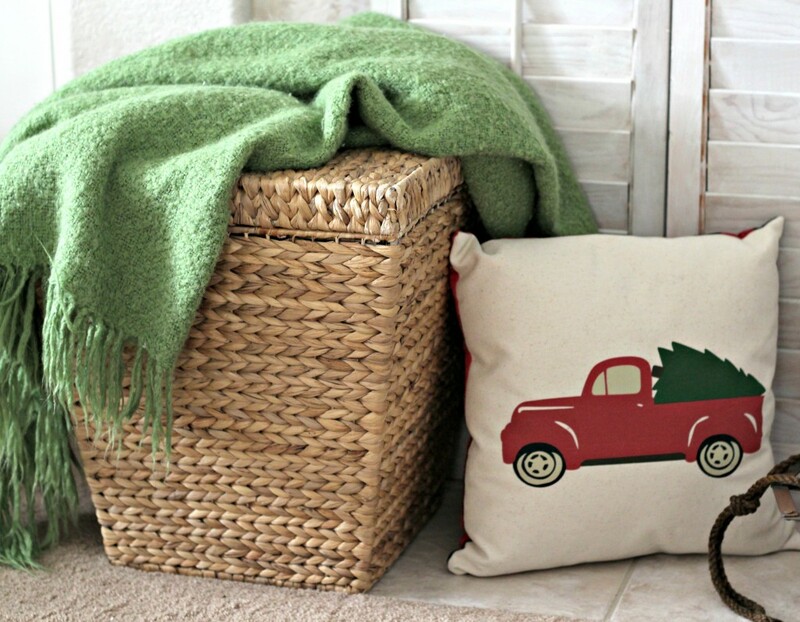 It makes them more available for cozy nights and adds a decorative element. 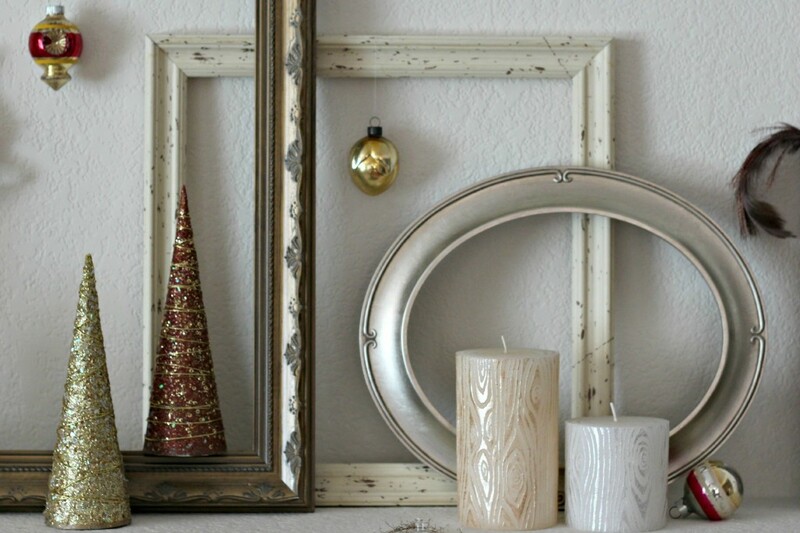 *Use extra frames for decorating. Adding frames to a mantel or bookcase add depth and interest to the space. 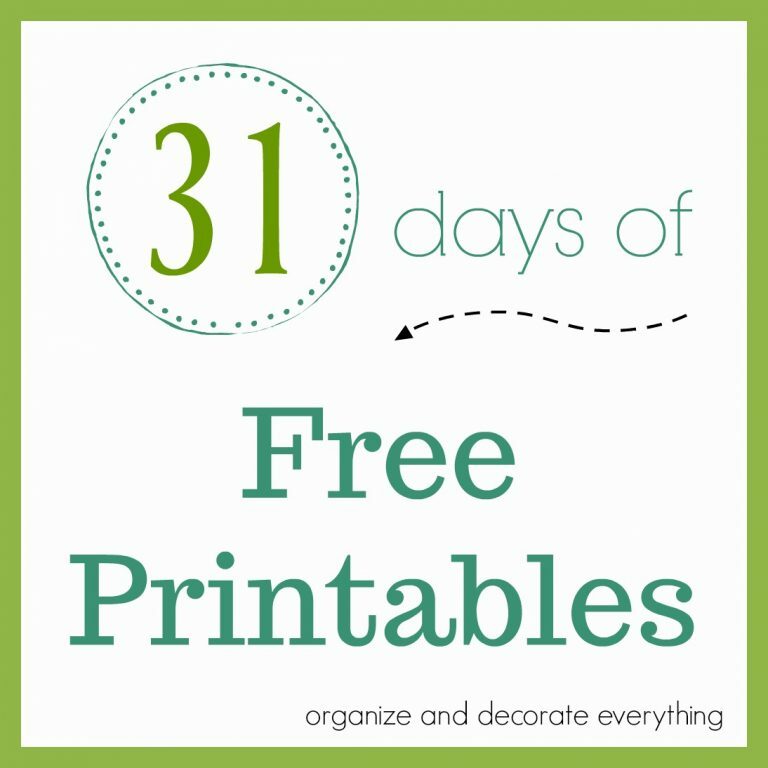 They’re perfect for holiday decorating to frame small decor items and to hang ornaments from. 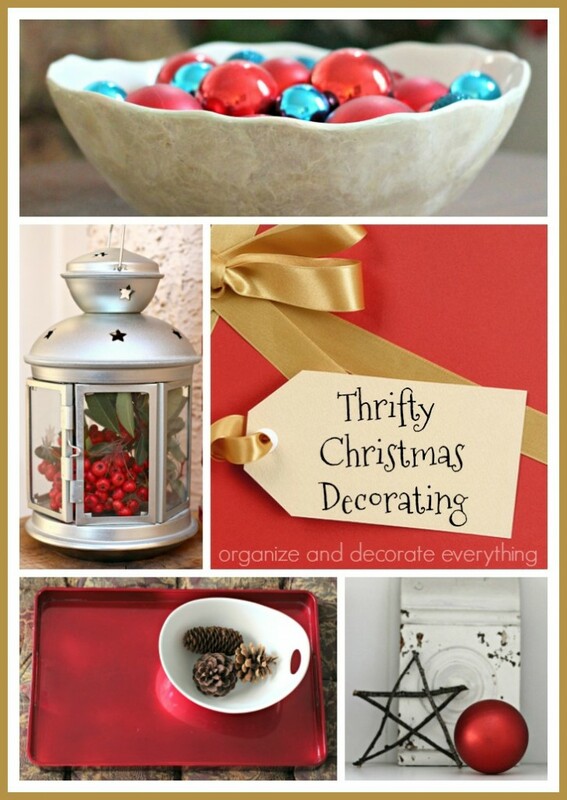 What else do you have around the house that you can use to add to your Christmas decor without spending any money? It’s like a treasure hunt and now you have more money for gifts or something else.